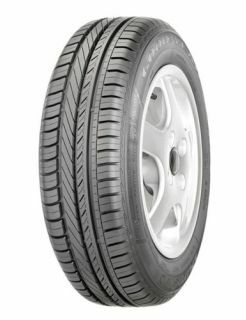 DuraGrip is the Fuel-saving tyre which is built for the modern family and city cars. The DuraGrip's equalised pressure distribution minimises the tyre's rolling resistance resulting in a much more cost effective, fuel efficient and longer lasting tyre. The tread on the tyre is also optimised in several different ways in order to be the safest and most cost effective tyre it can be. The tread pattern is designed to be very quiet while at the same time designed to disperse water as quickly as possible to stop the tyre aquaplaning in wet conditions. Another key benefit of the tyre is its responsive handling. Goodyear's 3D-BIS technology increases the amount of rubber which is in contact with the road and helps you to take any corner with confidence.